Backup Gadgets in Windows 7 following our easy steps. You do not need to use Windows Backup, no software, no complicated steps. Simply Copy paste to Backup Gadgets. The question is asked by a regular visitor Billie Walker, also our deviantArt group member. She asked some one who “advised” her to backup the whole system to Backup Gadgets. Its a shame to call Steps to Backup Gadgets! Its just copy-pasting to Backup Gadgets. To Backup Gadgets, simply copy the folder and paste it where you want to save it. After clean installation paste the Back Gadgets folder. The Gadgets in the Backup Gadgets “tutorial” screen shot can be found here and here. This Article Has Been Shared 1641 Times! 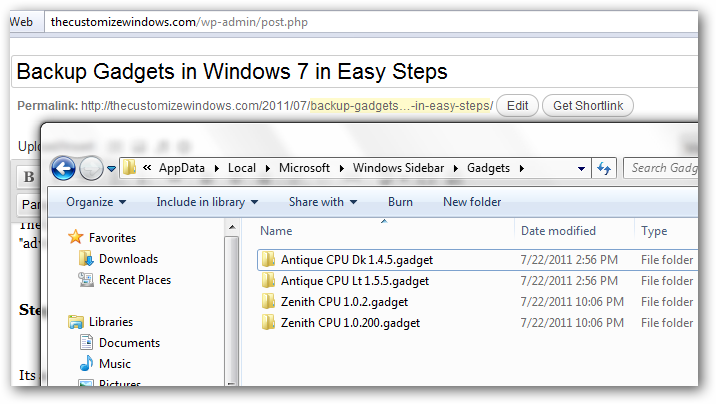 Cite this article as: Abhishek Ghosh, "Backup Gadgets in Windows 7 in Easy Steps," in The Customize Windows, July 30, 2011, April 25, 2019, https://thecustomizewindows.com/2011/07/backup-gadgets-in-windows-7-in-easy-steps/.